"In general, even with fortified foods, diet usually doesn''t provide enough vitamin D," Dr. Donald Hensrud, Preventive Medicine, Mayo Clinic. 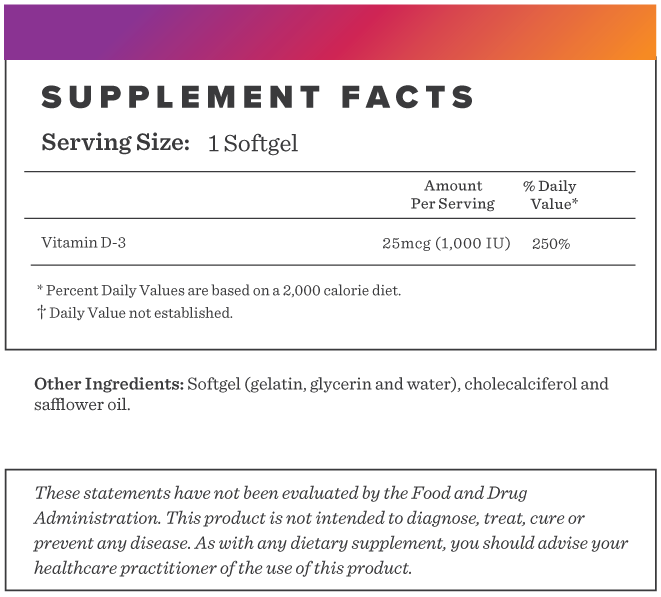 Not all Vitamin D supplements are created equal. Also known as the "sunshine vitamin," Vitamin D3 (cholecalciferol) is the form superior to sustaining proper levels in the body. Its crucial for normal immune system function and bone health. Vitamin D has been shown to help assist with calcium absorption which is needed for bone growth and maintenance. Vitamin D also has other roles in the body like helping with cell growth and helping the body maintain a healthy inflammatory response. 1. Penckofer S, Kouba J, Byrn M, Estwing ferrans C. Vitamin D and depression: where is all the sunshine?. Issues Ment Health Nurs. 2010;31(6):385-93. 2. Lips P, Van schoor NM. The effect of vitamin D on bone and osteoporosis. Best Pract Res Clin Endocrinol Metab. 2011;25(4):585-91. 3. Cannell JJ, Grant WB, Holick MF. Vitamin D and inflammation. Dermatoendocrinol. 2014;6(1):e983401. 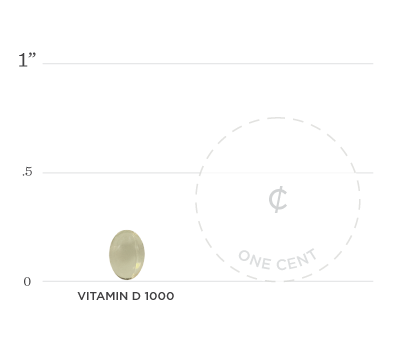 Below we've broken down the main functions of our Vitamin D - 1000IU and the benefits it can provide. Studies have examined the relationship of vitamin D and mood. Vitamin D deficiency was associated with the presence of an active mood disorder as assessed by the depressive symptoms. Vitamin D supplementation may decrease bone turnover and increase bone mineral density. According to several randomized placebo-controlled trials, vitamin D and calcium revealed a significant decrease in fractures. Several studies found an inverse relationship between vitamin D and markers of inflammation. Vitamin D3 supplementation in 6 out of 7 randomized control trials with patients who had highly inflammatory conditions including congestive heart failure, multiple sclerosis, inflammatory bowel disease, cystic fibrosis, and heart attack was associated with significant reductions of inflammatory markers.